In recent years, it's seemed that the season a football club will have is decided within the first few games. 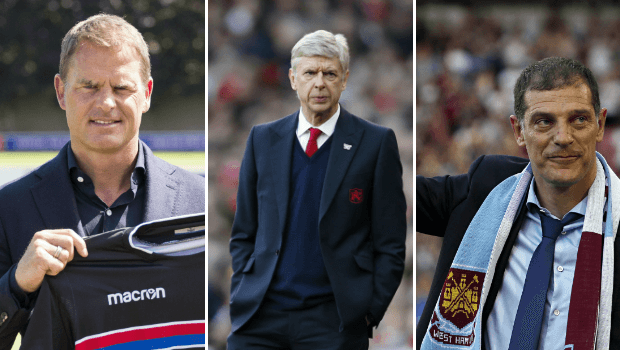 Whether they rise to the top of the table or sink into the murky waters of relegation, it's often the manager’s head that will roll first, as owners strive to change the course of the season. In what has been dubbed The Sack Race, the top sports bookmakers now take bets not only on which teams may win or lose, but also which manager will be the first to fall on his sword or pushed out the door. Although the current figures have fallen in recent years compared to the 12 sacks in 2012/13, the market still attracts a flurry of interest! The Dutch former defender is odds-on favourite to be the first for the chop from an EPL team at odds of 5/2, according to Betfair, despite only just having landed the role in June. To his credit, he managed Ajax for six years, before moving to Italy to take the reins at Inter Milan for the 2016-17 season when Roberto Mancini was let go. However, de Boer only lasted 85 days in charge before being ousted from the role, a decision he blamed on the new parent company, Suning Holdings Group. He comes to Crystal Palace with a grand vision, but only time will tell if he can last longer in London than he did in Milan. Bilic is not far behind de Boer in the odds of which manager will go first. Betfair is offering odds of 7/2 that the Croatian is next for the chopping block, after he narrowly avoided it last season when West Ham were fighting against relegation. The first two games of the premiership saw the Hammers pulverised 4-0 by Manchester United, only to lose again the following week 3-2 to Southampton. A shortage of wins soon could spell the end of Slaven’s brief tenure. Now halfway through his three-year deal with the Magpies, Benitez rode into Newcastle as its white knight, brought in to try and salvage the remains of the 2015-16 season. But despite a noble effort that saw Newcastle go undefeated for the last six games, they were nonetheless demoted to the Championship. He remained in charge and secured an immediate return to the EPL. Yet the return has not been the reward Rafael may have hoped, having lost to Nottingham Forest in the second-round tie of the EFL Cup, followed by defeats against Huddersfield and Spurs. Should it look like Newcastle will have to rally against relegation for a second time in only three years, Benitez will probably be looking for another job before Christmas. The former Man Utd player-turned-manager has been at Stoke since 2013, but last season saw the team finish 13th in the league – their lowest position under Hughes’ four years in charge. His tenure was also marked by the loss of long-term defender Marc Wilson, who absconded to AFC Bournemouth after a social media spat about Hughes’ training methods. Driving players away is a sure way to get yourself fired, so Betfair currently has him sitting at 10/1 odds to be the next booted EPL manager. Managers leaving is not always about results. Wenger has been in charge of the Gunners for over 20 years and during his long tenure has seen moderate success. But for fans it’s been frustrating that he has yet to move on, as the team did in 2006 when they relocated to the Emirates Stadium. With no trophies to show in recent years, the last straw may have been arch rivals Spurs finishing above them at the end of last season – the first time they’ve done so since Wenger has been in charge. Betfair is currently offering odds of 16/1, which could be a worthwhile punt. If you think you can tell which manager will be walking off into the sunset first, why not visit Betfair now? If you join today, the bookmaker is offering a £30 free bet to wager on your managerial choice. Don't forget, though, Betfair is the world' biggest betting exchange so unique odds can be found all throughout the site across tons of markets!